Oh, that crazy butter is at it again! Tonight we went out for dinner and frozen yogurt (yes!) with our neighbor friends. Super fun! We had a great time and had some fun conversations. This cattoon buttertoon is based on one such fun conversation with Paul and Leslie during a previous outing. Paul mentioned that he liked the ensuing humor when there is a grammar faux pas and gave this lovely example. So instead of thinking of riding your bike down the street and seeing some butter, we interpreted it as butter riding a bike. 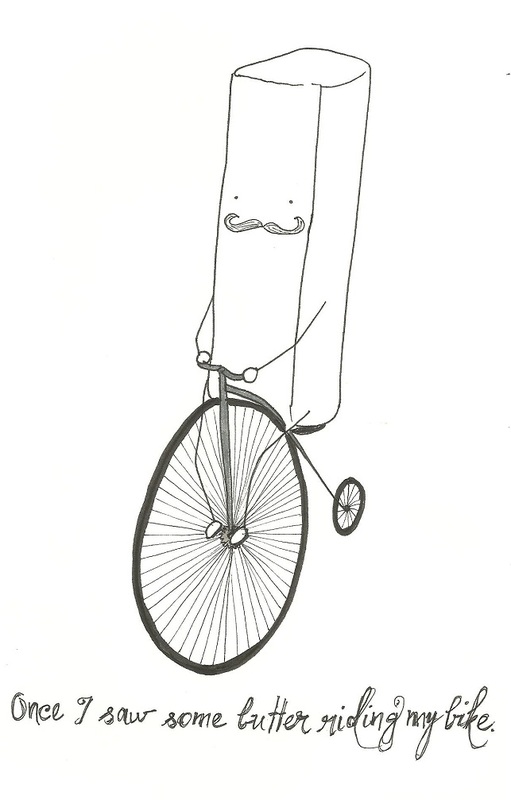 Thus, some butter riding a bike. I like its moustache. He’s very debonair. Oh cell phone, I love you.